Finally getting a few minutes to myself. Ok, still multi-tasking. Typing at the table while the little man eats lunch...Anyway, I'm starting early on my 2013 'resolutions', if you will. There are so many online scrappy places to play. I have many bookmarked, but haven't joined in. I decided that I'm going to try one new challenge/sketch blog a month. I figure that puts no pressure on myself. It might be more one month. Who knows. It can be overwhelming if I try to choose ahead of time, so I'm going to peruse the sites and play along when something strikes me. That leads me to today. I've been browsing at Sketches in Thyme for a while now, but have never joined in over there. Well, now I can say I have, with not one, but two sketches! The first is sketch #96. This is a favorite photo of mine. I've been struggling coming up with the right idea and this sketch was a great one! A simple Bazzil CS matte, punched withe a Fiskars border punch and tied with random twine. I used Queen & Co, Target, and some other washi tape on white CS then used an EK success punch to create the chevron-like strips. I used some of the leftover punched out pieces to create the corner clusters, splattered a few different colors of Mister Huey and Tattered Angels mist. 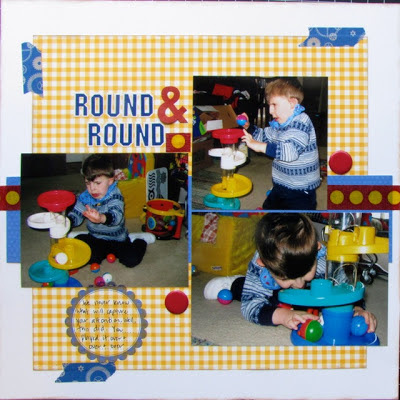 A few yellow buttons to round out the yellow Doodlebug letters and I had the LO I was imagining! For this one I used sketch #97, but I converted it into a one page sketch. I'm kinda washi tape crazy, so it's kind of appearing on a lot of my pages right now. Busy photos mean a simpler design for me. But simple doesnt mean I cant use patterned paper! I stuck to the 3 primary colors that stood out to me, red, yellow and blue and repeated them throughout the page. I wanted to imitate the imagery of the balls going around and around, so I used circles where I could with the brads, 7 Gypsies tape, the blue tape and Stampology journal stamp. Thanks Sketches in Thyme for inspiring me with some great sketches! Cute layouts! I love your idea of trying out new sites every month. I think I might have to adopt the same idea! These layouts are so gorgeous! I love the bright colours that you have used and I love the chevrons in the background of your first layout. So glad that you have joined us. Happy New Year and thanks for joining in at Sketches in Thyme. What a precious picture of your boys. The layout is perfect! 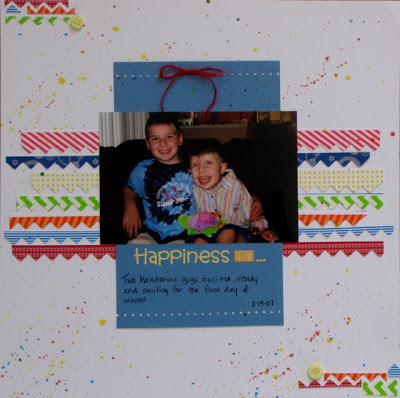 Awesome layouts- I am so glad you finally decided to join in the fun! I love how you used the border strips as the chevron element in the sketch, and I love the addition of the washi tape in the second. Thanks for joining us at Sketches in Thyme this week! These pages are so beautiful! Thank you for joining us at Sketches in Thyme. happy New Year! So glad you joined us! Such great pages! LOVE how the playful color palettes work so well with your fabulous kid pics! Thanks so much for playing along with us at Sketches in Thyme!